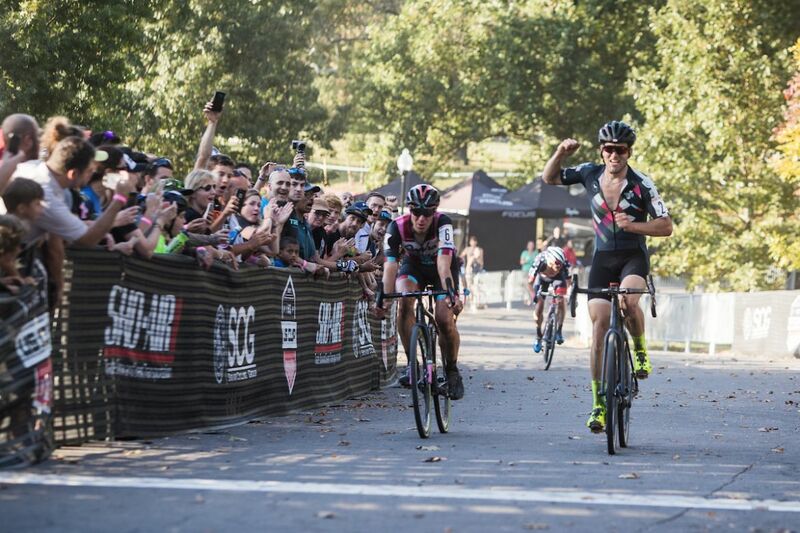 Kaitlin Keough and Tobin Ortenblad were victorious on day one of the Sho-Air US Cup-CX/Charm City Cross. BALTIMORE, Maryland (VN) – Kaitlin Keough (Cannondale-Cyclocrossworld.com) led for nearly the entire race at the Sho-Air US Cup-CX/Charm City Cross Day 1, winning solo with a 25-second lead over her teammate Emma White. Ellen Noble (Aspire Racing) charged across the line for third. The two teammates, along with Noble, quickly separated themselves from the rest of the pack under unseasonably warm conditions at the UCI C1 event in Baltimore, Maryland. The mostly grass track was seared from the day’s previous groups, which included almost 1600 pre-registered athletes for the weekend. In a thrilling men’s race, strategy played an important role in the outcome, as Tobin Ortenblad (Donkey Label-Santa Cruz), Jeremy Powers (Aspire Racing), Stephen Hyde (Cannondale-Cyclocrossworld.com), and Kerry Werner (Kona) charged into the last lap together, battling for position until the last corner of the race. Ultimately, Ortenblad sprinted to victory, passing Powers at the line, with Hyde completing the podium. Werner, who rode until the final quarter lap amongst the fold, rolled across the line soon after in fourth. Maghalie Rochette (Clif Pro Team), Noble, Keough, and White led the pack around the first lap of the race, just gapping the rest of the field. By the end of lap one, White had gone to the front, bringing Noble with her. Keough was close behind. Crystal Anthony (Maxxis Shimano) led the chasing pack. White, Noble, and Keough gained even more separation by the end of lap two. Anthony, Caroline Mani (Van Dessel/Atom Composites), and Rebecca Fahringer (Stan’s No Tubes) chased 15 seconds back. Soon after, the Cannondale pair went to the front and began to distance Noble. Meanwhile, Fahringer gapped her group over the barriers and set off in chase of the leaders. Midway through the third lap, the gap was five seconds. Noble was caught in no-man’s land and struggling to hold the gap steady. At the line, the gap was nine seconds, as the two Cannondale riders took turns on the front throwing in digs. Fahringer was another 10 seconds back with Anthony closing the gap with every pedal stroke. With two laps to go, Keough finally broke the stranglehold, distancing her teammate by five seconds by the time they cleared the barriers. Noble began to fade even further but still held a 12 second lead on Fahringer and Anthony. At the bell, Keough held a 10-second lead over White. Noble was cruising another 20 seconds back. Anthony had by this time passed and distanced Fahringer, and was another 10 seconds behind the final podium spot. 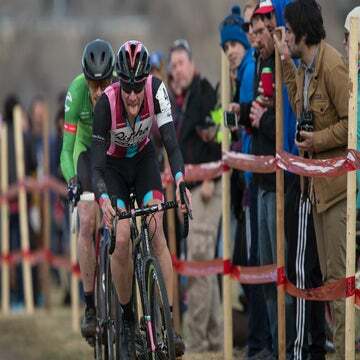 Keough now leads the Sho-Air US Cup-CX Series over White. In the men’s race, Ortenblad took the holeshot to lead the group. Through lap one, nearly the entire field was strung out single-file, with Ortenblad still in the lead, as they twisted through the grassy knolls of Druid Hill Park. At the start of lap two, Stephen Hyde surged as the group swelled. Slowly but surely, the group began to splinter. Jeremy Powers and teammate Spencer Petrov (Aspire Racing), Kerry Werner (Kona), Hyde, Curtis White (Cannondale-Cyclocrossworld.com), and Ortenblad comprised the front group with five laps to go. Jamey Driscoll (Donnelly Racing) dangled a few seconds back. The race stayed in that formation for another lap, with Powers on the front for nearly the entire loop. Midway through the next lap, Hyde took the lead and opened up the throttle. Driscoll was the first to be popped. Soon it was Werner’s turn to attack. White was put into difficulty and the gap began to grow. The lead group was down to five: Werner, Hyde, Powers, Ortenblad, and Petrov. With two laps to go, Petrov, 19, was the next to struggle to hold the front group. Still, he held the pace, until just before the last lap began when Hyde threw down a vicious attack. Still, the group remained intact. On the last lap, Powers attacked into the 20-step flyover to move into second place behind Hyde. Out of every corner, Hyde snapped into high gear, and Petrov was dropped. It was down to four. Aggressive racing saw the four swapping leads, blocking, and positioning themselves for a sprint finish on the last half of the last lap. Powers led onto the paved finishing straight, but couldn’t hold off a charging Ortenblad. The Santa Cruz rider leads the overall in the Sho-Air US Cup-CX Series, having won all three rounds that have been contested.